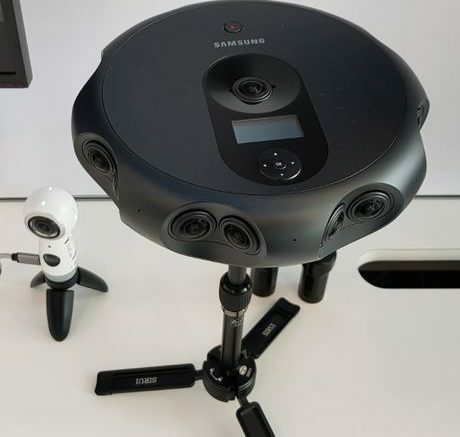 Samsung unveiled a new camera on Wednesday, Oct. 18, flanked with 17 cameras and six microphones and can create highly immersive 360-degree and virtual reality content in glorious 4K resolution. Unlike the company’s more entry-level Gear 360 camera for mainstream folks, the Samsung 360 Round appears to be for legitimate pros — that is, pros who have plenty of money to spare. The 360 Round features beastly performance but that comes at a deadly price point: $10,500. The 360-degree camera powerful enough to livestream 4K VR videos at 30 fps, and as mentioned, the puck-shaped device covered in 17 2-megapixel cameras to record stereoscopic 3D, VR, and 360-degree videos in 4K. There’s also some native software that works to stitch together immersive video with virtually no lag. Inside, there’s 10 GB of RAM and 40 GB of internal storage, which plenty but expected for a device that regularly records large-size 4K files. It supports LAN or USB-C connectivity and can hooked up to an SSD with up to 2 TB of storage. Pros who often shoot in inclimate weather to get scenic, breathtaking shots of rain falling on landscapes won’t have to worry, as the 360 Round features IP65 Dust and Water resistance. Samsung will ship the 360 Round sometime in October in the United States, and other countries will get it soon thereafter. But it’s worth keeping in mind that despite the camera itself already costing so much, the PC requirements for livestreaming and post-processing will inflate the total price significantly. For processing video, Users must at least have a 64-bit OS for 4K, 16 GB DDR4 RAM or more, an Intel Core i7-6700K chip or above, and an Nvidia GTX 1080 chip. On the other hand, livestreaming and broadcast ask for at least a 10-core i7-6950X chip, 32 GB of RAM, and two — yes, two — GeForce GTX 1080 Ti GPUs. That won’t be an issue for pro content creators, producers, and filmmakers, however, as it’s highly likely they already have a compatible system that meets the camera’s performance requirements. Be the first to comment on "The Samsung 360 Round Camera Has 17 Lenses And Can Livestream 4K 3D Videos At 30 FPS"